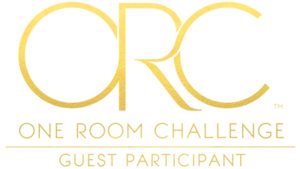 It's week two of the One Room Challenge! Be warned: this post is basically a photo dump of all the ugliest and most tedious parts of our bathroom renovation. If you skip it and check back in next week, that's FINE. If you're a glutton for punishment or you're planning to DIY a bathroom soon, then let's proceed. As I mentioned last week, part of our bathroom project involves doubling the footprint of our shower. It was formerly 2.5' X 3', and it's now 5' X 3'. We used a simple pony wall to extend one side. Patrick built the wall using 2X4s and his framing nailer, checking for plumb, level, and square as he went along. After vacuuming the area thoroughly, he installed felt paper to protect our plywood subfloor from the moisture in the mortar mix we would use to build a shower pan. As part of this project, we're repiping our entire house. The blue and red tubing is part of the new PEX system we've begun installing. It's not connected yet (we're still using our old galvanized pipes until Patrick can take a day off from work to do the switch), but Pat had the foresight to install metal guards to protect the PEX from being accidentally punctured during our cement board installation. Because these tubes won't have water running through them until after the tile surround is complete, it was super important to make sure they stayed intact. Shower niches can be very controversial, but I knew it was important for us to have one. I honestly don't understand where people who don't have them put their products and razors. On the floor? Feel free to enlighten me. Patrick framed this one out in almost no time (which in literal DIY minutes equates to somewhere between twenty and thirty minutes). Installing the cement board was much more straightforward than I expected it to be. He got the whole thing finished up in an afternoon. The most difficult part of the cement board installation was cutting the notch around our shower curb. Patrick used his plunge cutter. It was very dusty and took an eternity, but it eventually got the job done. He made most of his cuts using a circular saw with a masonry blade. There was so much dust that I was worried for a few days that I might have damaged our camera. Thankfully it seems to be just fine. Before he could complete the backer board, we needed to decide exactly where the shower system would be installed, so he could get the PEX where it needed to be. We selected a shower panel with body sprayers, so it was especially important to get the height right. Too low = having to duck our heads to wash our hair, too high = getting sprayed in the face with the body sprayers. It's a good thing we're exactly the same height (technically he's got half an inch on me, which he gloats about way too much for an adult). We actually ended up needing to go back and redo this portion of the installation, because we opted to go with copper stub outs. I was nervous that running the tubing through the abrasive backer board could eventually lead to leaks. I'll describe that more in my post on our PEX install. Installing the shower pan required math. The whole thing needed to slope towards the drain at a rate of 1/8" - 1/4" per foot. We opted for 1/4" because we wanted to make double sure no water was trapped away from the drain. After we found the correct height for each wall, Patrick marked a line at the proper height using a chalk line. He laid steel mesh to reinforce the mortar shower bed. Mixing the mortar for the shower pan was another dusty, sweaty process. Getting the pan appropriately sloped and smooth was stressful. If he got this part wrong, no amount of waterproofing could fix it. We'd just have to tear it out and start over. After noticing a ridge against the back wall, he had to stretch out across the very wet five foot pan to fix it. I held my breath the whole time, sure he was going to splat into it and undo all his painstaking work. He didn't! We let the bed cure for about a week, and Patrick used thinset to fill all the screw holes and seams, using mesh fiber tape on all corners. Then he started applying our waterproofing agent, RedGard. It's a rubbery membrane that can be brushed, rolled, or troweled on, which helps reduce cracks in tile and (more importantly) creates a moisture barrier. We love that it means the shower pan won't be getting saturated with water every time we shower. Patrick was super grossed out by how wet the old one he ripped out was, even though we hadn't showered in it since the day before. He applied it as high as he could reach, and did three layers, switching directions with each application. As you can see, it goes on pink and turns red when it's dry. We did the water test this weekend, filling it to the lip of the drain with water and checking after a few hours to see if the water level had changed. It passed! That means we're finally FINALLY ready for tile. As I type this (Tuesday afternoon), Patrick is on his way home from a very long day at work, and the plan is to start tiling as soon as he gets home. HOPEfully next week's post will be all about our pretty new tile! To see how the other participants' rooms are coming along, click here! PS: We did start tiling last night, and it's looking so good! Unfortunately, there's a bit of a learning curve, so I spent an hour on my hands and knees scraping excess thinset out of the cracks with a plastic fork. On the bright side, it was my first solo contribution to the room, so Patrick can no longer claim to have done it all by himself. Bathrooms are a lot of work but you guys are killing it! You're already tiling...wow! I can't wait to see this space finished.